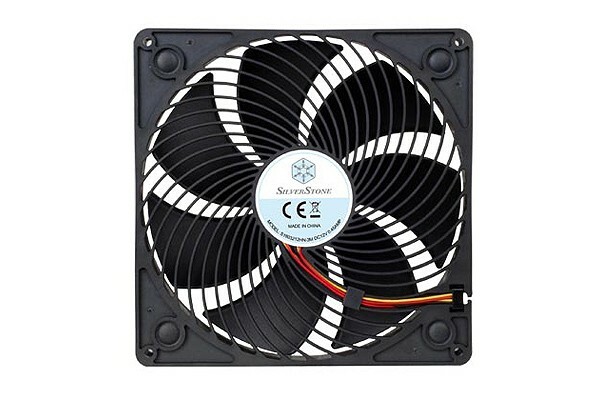 Traditional PC fans are designed to channel air out of the case, hence for many years the sheer Airflow was the main factor in fan performance. But as in PC cooling the overpressure operation becomes more and more important Silverstone has created the Air Penetrator which was special designed for sucking in air. Development of the Air Penetrator was based around focussing of the Airflow in a whirling stream which more effectively penetrates the obstacles inside of a PC case such as cables or expansion cards. This innovative new airflow design allows more efficient cooling inside of the case. The focussed airflow creates enough pressure to carry the air at extremely low noise levels as far as one metre! This unmatched efficiency makes the Air Penetrator not only the ideal blowing fan, it also is perfect for coolers with low density and for cooling of other loosely arranged components. This fan came in a computer case I have used for many years and did a great job of promoting airflow with hardly any sound. I dropped my case years ago and broke a propeller off the fan, and it rattled like it should so I broke them all off. I also didnt bother to fix a CPU cooler that went bad on me and well now my machine is smoking and has a meteorite right through the center of the motherboard because I disabled protection in cmos years back. I am starting over and have my old case - first thing I am doing is replacing this fan because it is the best fan I ever had and would have prevented the small fire in my garage for sure. I highly recommend this product. Kein Klappern, Rattern, oder Schleifgeräusche von den Lagern. Absolut lautlos. Selbst bei 250 Umdrehungen pro min, sind keine Lagergeräusche zu hören. Die Lüfter sind so Leise (bei 250-500 Umdrehungen pro min ), das ich of nachschaue, ob diese sich drehen. Bitte immer, egal welcher Lüfter, diese für ca. 24h Vertikal bei max Drehzahl einlaufen lassen. Dabei verteile sich das Schmiermittel. Bei Magnet-Lagerung, richtet sich die Achse aus. Dies kann ich bei Enermax T.B.Apollish oder Enermax D.F. Pressure nicht bestätigen. Diese Lüfter hatten bei mir Klappern, Rattern und Schleifgeräusche. Das bei 8 von 8 Lüfter.